This one takes a little while (at least 8 hours), as you have to give enough time to make the pickles. But it’s so worth it. I usually let the cucumbers soak for much longer (about 24 hours). Combine first 7 ingredients in a medium saucepan over high heat; bring to a boil. Remove pan from heat; cool completely. Place cucumber slices in a large bowl; pour vinegar mixture over cucumbers. Cover and chill cucumber and vinegar mixture 8 hours or overnight. Combine EVOO and white wine vinegar in a small bowl, stirring well with a whisk. Strain cucumbers; discard liquid and tarragon sprigs. Place cucumbers on plates. Place 1 cup watermelon cubes on each plate. 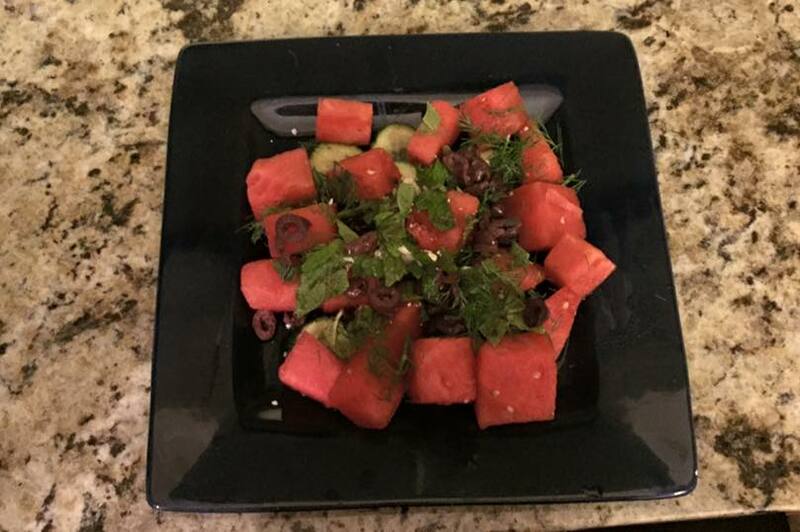 Top watermelon evenly with cheese, mint, olives, and dill. Drizzle evenly with vinaigrette.